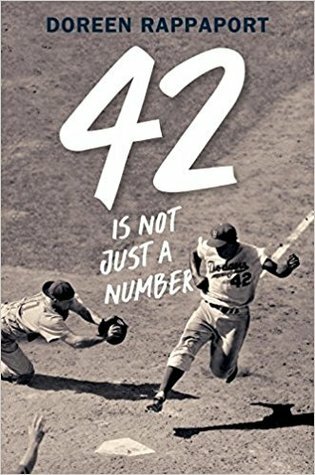 42 Is Not Just a Number is a compelling sports biography for upper elementary and junior high readers. Drawing on a range of sources, it recounts the life of Jackie Robinson, the first black player in the major leagues of baseball. The text deals with Robinson’s childhood quickly, setting a context for the discrimination Robinson experienced, and then concentrates on his years playing ball and the struggles he faced despite his obvious gifts. Robinson’s story wraps up with a brief denouement: his induction into the Major League Hall of Fame, his death in 1972, and a celebration in 1997 that acknowledged his courage in daring to play ball in an openly racist setting. This book doesn’t pull punches. It includes examples of the language Robinson encountered (although offensive, what’s captured in the book is much milder than what Robinson would have lived with virtually every day of his life), and describes the violence and hatred that characterized the United States in the 1930s and 1940s. Many adults would like to think things are better now, and in some respects they are; but many students — particularly black students — will recognize the complex racism that persists today. This book is, sadly, still timely and relevant, but it arrives at a moment when it may perform valuable work for young readers of all backgrounds. The book is thoughtfully constructed for a range of readers. The chapters are short and cleanly presented, the author has provided notes and a bibliography, and the text is supported by an index. All in all, this compact biography is a smart, accessible resource for both research and independent reading. Many young people today have a hunger for social justice, and 42 Is Not Just A Number speaks with hope to the human potential for change. This vital book should be in every school and public library, especially in areas where librarians believe their patrons won’t read a book about race issues. This is exactly the kind of strong book for a trusted adult to recommend to make a positive difference in a reader’s life. This review was originally published in Resource Links, February 2018.